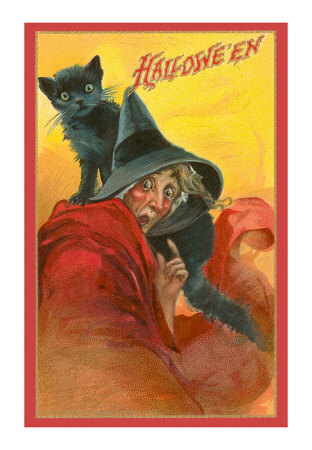 The black cat with the arched back is part of the stereotypical Halloween picture. The image is every bit as much a part of Halloween as the little ghouls and goblins that ring doorbells shouting "Trick or Treat." Have you ever wondered how black cats became part of the Halloween myth? The black cat first became intertwined with the belief in witches and witchcraft in the 15th century — a relationship that persists to this day. In an effort to stamp out pagan religions, witch hunts became a common occurrence throughout Europe in the 1480s. People in those times believed that all witches kept a "familiar". A "familiar" is more accurately called a "familiar spirit", the name deriving from the word "family". This was believed to be some form of spirit that either took the form of or inhabited the body of an animal. Familiars were believed to assist witches in casting spells. Sometimes the familiar was believed to be the source of the witch's magical powers, possibly channeling this from some demonic entity. While many different animals could be a familiar — everything from owls to toads — the black cat became the most common animal associated with witches. Why should the cat —and in particular the black cat — be the most common familiar? Perhaps it is because the ebony coat lends an air of mystery and magic to the feline form. Or possibility it is simply that folk tales often tell of cats that have psychic abilities. If one is going to choose an animal to assist in witchcraft then it makes sense to select one that is believed to have special powers. A more mundane possibility may be that cats are clever, inquisitive, stealthy creatures that can go almost anywhere without being noticed. In the dark of night a black cat can be almost invisible. When a cat cries it can be quite blood-curdling so it seems an ideal choice of companion for a witch. Modern "witches" (more correctly called Wiccans) prefer to think of their familiars not as spirits but simply as animals with whom they are psychically attuned. Regardless of the reason, black cats will be forever part of the mystique of Halloween . . .